Author and educator, Sir Ken Robinson, challenges the way that we are educating our children. He advocates a radical rethink of our school systems in order to cultivate creativity and acknowledge multiple types of intelligence. * Current education culture needs a revolution. * Children need a broad curriculum to develop and celebrate their various talents. * The role of a teacher is to facilitate learning through: engaging, stimulating, provoking, mentoring and delivering. * Give responsibility to the schools and teachers by supporting them, trusting them, helping them develop their skills, so that they can individualise learning for their students. * Our students have seeds of possibility waiting, which with the right conditions will flourish. Not about amount of money or class sizes. 1). Human beings are naturally different and diverse. Education at present is based on conformity; finding out about what children can do across a very narrow spectrum e.g. maths, english, science. This is necessary but not sufficient. A real education must give equal weight to the arts, physical education etc. 10% of children diagnosed with ADHD – don’t be surprised if children start to fidget, they are children and they find clerical work boring. Children are suffering from childhood not a psychological condition. Children prosper best with a broad curriculum that celebrates their various talents not just a small range. The Arts, improves math scores but are also important as they speak to parts of children’s being that are otherwise untouched. Light the spark and they will learn without any assistance normally – children are natural learners. Curiosity is the engine of achievement. One effect of current education culture has been to de-professionalise teachers but there is no system / school in the world that is better than its teachers. Teachers are the life-blood of the success of schools. Teaching is a creative profession, not a delivery system. Great teachers: mentor, stimulate, provoke, engage, as well as deliver. If there is no learning going on then their is no education going on. The role of the teacher is to facilitate learning. Culture has come to focus on testing, standardised testing has a place but they should not be the dominant culture, they should be diagnostic and support learning – not obstruct it, which it often does. In place of curiosity we have compliance whereby teachers are therefore encouraged to follow routine algorithms rather than to excite that power of imagination and curiosity. 3). Human life is inherently creative. We create our lives and can recreate them as we go. It is why human culture is so diverse and dynamic. One of the roles of education is to awaken and develop these powers of creativity. Instead we have a culture of standardised testing. Doesn’t have to be this way. Finland (regularly comes out on top) they have a very broad curriculum and do not obsess over the standardised tests. There is no standardised testing in Finland. They don’t have a dropout rate. If people are in trouble they get them some help and support them. Only 5 million in Finland – compare to an American state. They individualise teaching and learning, they recognise that it is students who are learning and the system has to engage them, their curiosity and their individuality – that’s how you get children to learn. They attribute a very high status to the teaching profession, support and PD (PD is an investment). They devolve responsibility to the school level to get things done, because education goes on in schools and you need to give the discretion back to those people who are at the ground level, not sitting in a committee room of legislative departments. There are good things going on in education, but it is happening in-spite of the dominant culture ofd education not because of it. Current policies are based of mechanistic conceptions of education, like education is an industrial process. Education is not a mechanical system, but a human one. Alternative duration programmes to get children back into education: very personalised, support for teachers, links to community, broad and diverse curriculum, often involve children outside school as well as inside school. If we all did this, then there would be no need for ‘alternative education’. There are conditions under which people thrive and those that they don’t. Death valley is the hottest and driest place in America – in the winter 2004 it rained and in the spring 2005, the whole floor was carpeted in flowers. Death valley isn’t dead, it is dormant. Seeds of possibility just beneath the surface and with the right conditions, life is inevitable. The real role of leadership in education is not command and control, but climate control, creating a climate of possibilities. We need a revolution. This entry was posted in TED Education, The "Smart" questions facing education, What should I be teaching? Be on the curriculum? 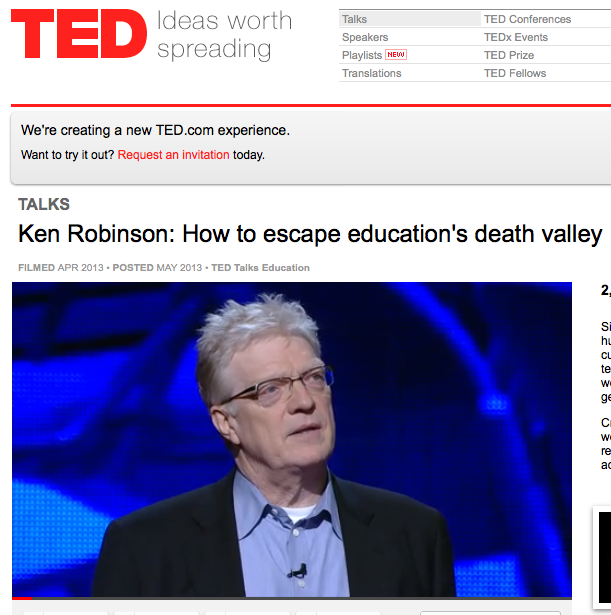 and tagged creative, curiosity, Ken Robinson. Bookmark the permalink.